iCare DataRecovery - программа для восстановления удаленных и отформатированных файлов с жестких дисков, sd карт, карт памяти и USB Flash накопителей. Программа поможет восстановить файлы с нечитааемого раздела диска, если поврежден загрузочный сектор или после вирусной атаки. iCare Data Recovery Pro can recover files from formatted hard drive, recover deleted, virus lost files. Have you formatted hard drive partitions and then need a recovery? Do not worry, with iCare Data Recovery Pro, you can take files back from formatted hard drive, raw file system. It is a file recovery software to undelete, unformat, undo shift+delete. It is pretty useful when you accidentally formatted hard drive, partition unintentionally deleted, emptied files from recycle bin, lost photos from digital camera sd card, lost files from memory card, flash card, pen drive, removable hard drive. With the deepest file search technology, you can recover lost files even missed by other data recovery utilities. 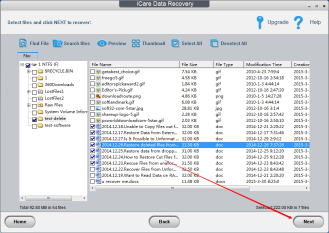 iCare Data Recovery Software can recover files from hard disk drive, external hard drive, usb drive, sd card. What's more advantageous? It is hardware raid supported file recovery software.